Keeping the Pounds Off! : Mock Grapefruit Smoothie? When the temperatures top 95 degrees is when I most want to stop at the Twistee Treat and gobble down ice cream in the name of cooling down on a hot day. That is not an option for me today so I have been occasionally drinking a can of Fresca. I like the grapefruit flavor - not too tart and it is sugar free. Funny thing about grapefruit - I like the fresh fruit but hate it as a juice. I don't really want to drink diet soda so I came up with an alternative. Something cold and refreshing, mostly natural and full of flavor. It even has fiber. Put it all in a blender (I use a wand) and blend until it is like a smoothie. Drink it fast or serve it over more ice cubes because it melts quickly. When I tasted it I realized it tasted just like a grapefruit smoothie. 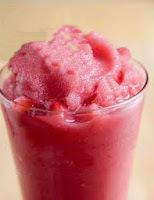 Made as above, it is a refreshing serving of fruit that will squelch the summer doldrums. I have also made this adding a scoop of unsweetened whey protein and 1/4 cup of almond milk, turning it into a protein drink. Non-fat, no added sugar, minimal processing - and it keeps my thoughts from wandering to the ice cream aisle. It is a bit of perfection on a hot, humid summer afternoon. YUMMY!! I'm going to try this tomorrow when I make my produce run! !